Vintage 1970s or early 1980s "deadstock" belt buckle from an old supplier who went out of business 20-30 years ago! 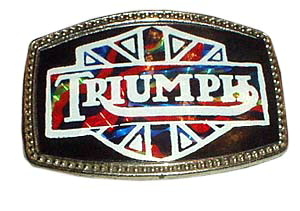 Its really cool- its a black foil sticker that with the TRIUMPH (motorcycles) logo in white outline with shiny multi-colour foil surrounded by white. The buckle part is either a really light-weight metal or a heavy-weight plastic painted chrome to look like metal. A little over 3" long and 2" wide. I have a few of these buckles. Get some for your friends, too. Condition: Very Good. Never Worn. This is NOT cast metal, thats why it is cheaper-The stickers are a little loose in a few areas and could use to be reinforced and wiped down. Still damn cool though!